(VOVWORLD) - Chairman of the Party Central Committee’s Organization Commission Pham Minh Chinh hosted a reception in Hanoi on Wednesday for Secretary General of the Liberal Democratic Party (LDP) of Japan Nikai Toshihiro. Toshihiro, who is also Chairman of the Japan-Vietnam Friendship Parliamentarians’ Alliance and a special envoy of Japanese Prime Minister Shinzo Abe, came to Vietnam to attend the state funeral of President Tran Dai Quang. He sent his condolences to the Vietnamese government and people, saying President Quang made a great contribution to the extensive strategic partnership between Japan and Vietnam. Mr. Chinh, who is also Chairman of the Vietnam-Japan Friendship Parliamentarians Group, expressed his sympathy to the Japanese government and people for the damage caused by natural disasters since the beginning of the year, which caused a huge loss of lives and property. 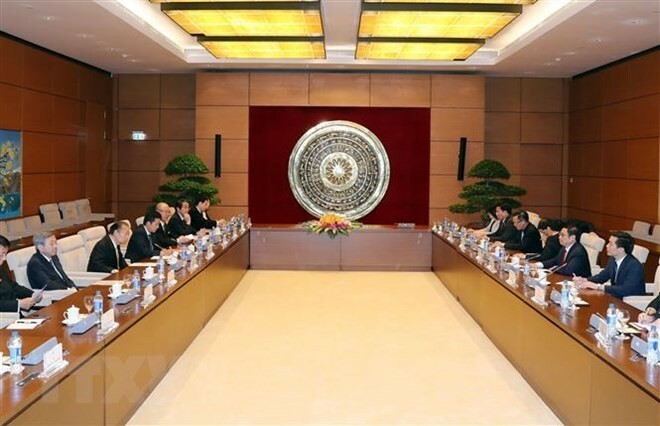 The two sides agreed that with similar cultures and shared strategic benefits, Vietnam and Japan have common interests in bilateral and multilateral cooperation and political trust.